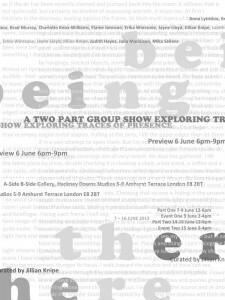 A two part group show exploring traces of presence curated by Jillian Knipe. Part One features installation, film, painting, drawing and sculpture by Andy Lawson, Anna Lytridou, Charlotte Knox-Williams, Elaine Johnson, Erika Winstone, Jayne Lloyd, Jillian Knipe, Judith Hayes and Julia Maddison. Part Two will exhibit a trace of Part One where partially dismantled works will sit alongside new pieces, including collaborative sound and projections by Brad Murray, Mika Sellens and Jillian Knipe. The experience of what is in the space involves a continually changing sense of past, present and future. A sense of almost but not exactly. Something illusive, imprecise, even fragile, rather than solid and concise. 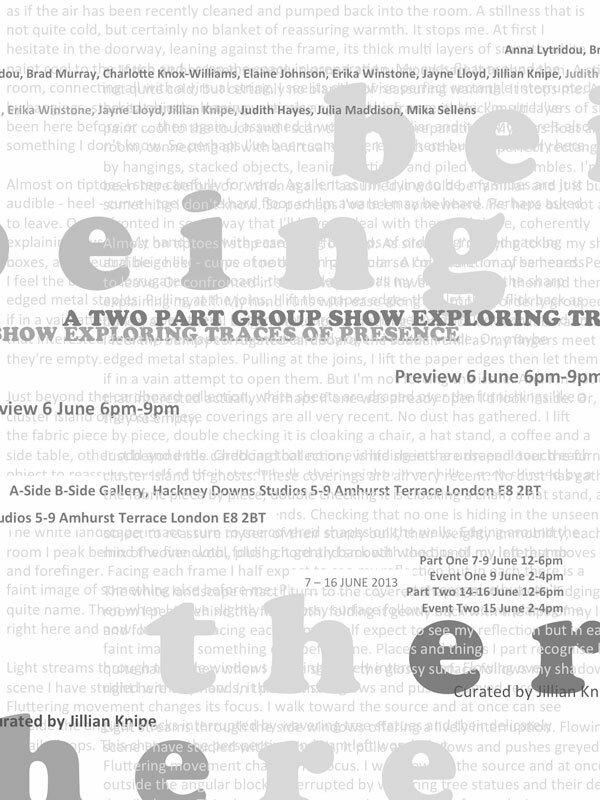 Works selected for being there play with this continual shift. Alongside a sense of precariousness of presence, the artists have favoured the use of white. A richly and symbolically ambiguous ‘colour’ for its polar opposites; white is blank, nothingness, death in one context then flips to spacious airiness, every colour of light combined and hope in another. Its neutrality accentuates the changing light through the window. Its quiet continually interrupted by visitors.